In both campaigns, your goal is to survive the war while accumulating as many Victory Points (VPs) as possible. Each day of the campaign you will be sent on a particular mission, either to advance through an area of territory, battling more entrenched enemy forces, or defending a previously won position against a counterattack. You decide how to proceed through the day’s campaign map, and when you encounter enemy forces, how to deal with them. Along the way, your crew will gain experience points and skills that will enhance your chances of survival and victory. The M4 Medium tank, particularly earlier its models, was vastly out-armoured and out-gunned when they arrived in Normandy. You will have to make best use of cover, smoke, and tactical choices when facing German Panther, Tiger, and King Tiger tanks, not to mention AT Guns and Self-Propelled Guns (SPGs). This manual outlines the basics of Armoured Commander, but survival in the battlefields of Europe will require full use of everything at your disposal as Commander, as well as a lot of luck. 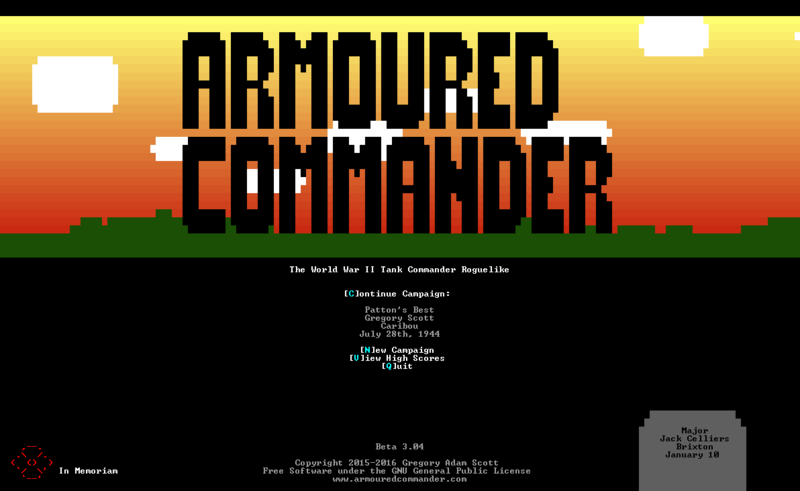 Armoured Commander draws heavily on the legacy of tabletop wargames. When determining whether actions are successful, or when generating a random event or result, the program generates a random number, applies modifiers to that result based on different conditions, and checks it against a table to determine the final result. 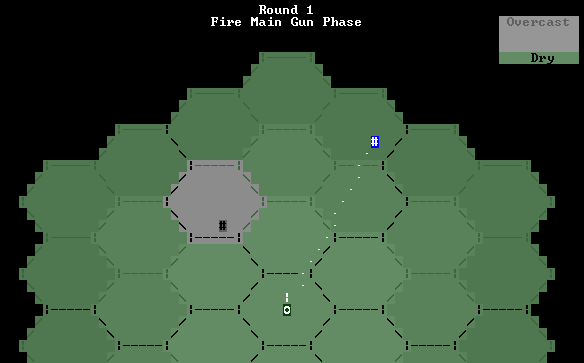 Most actions, including firing the main gun, determining armour saves, and doing morale checks, simulate two six-diced dice rolled and their results added together, known as 2D6. Since the goal is to equal or roll lower than a target score, good modifiers are negative (e.g. a -1 modifier to hit makes it easier to hit) while bad modifiers are positive (e.g. a +2 modifier to armour makes it more difficult to penetrate). The odds for a 2D6 roll form a pyramid of percentile odds, with more likely results clustered around 7, and the 2 and 12 results (snake eyes and boxcars) being quite unlikely. What this means is that these outliers are used for rare occurrences (critical hit and weapon malfunction, for example) and you are more assured of getting a roll result that is around 7 before modifiers. So even though game results are always random, you should have a good idea of what the odds of a successful hit or save will be, and unlikely results should be rare, but not impossible. From the main menu, you can [C]ontinue a campaign in progress (letters in square brackets indicate the key command for that option), start a [N]ew campaign, [V]iew high scores from previous campaigns, or [Q]uit the game. Crewmen who have died in previous games are memorialized in the bottom right corner of the menu. If you already have a saved campaign in progress, starting a new one will delete the old campaign, so confirm that you actually want to do this with [Y]. 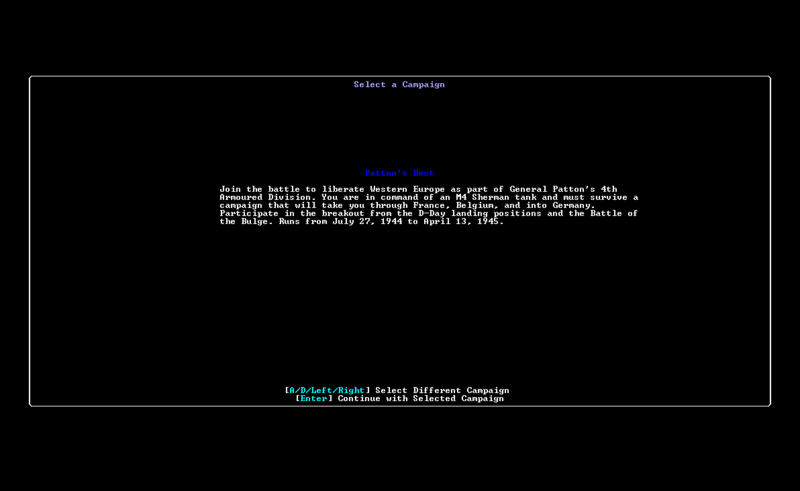 You can save your campaign at any point and continue it later; details about a campaign in progress will be displayed on the main menu. At present (Beta 3), ArmCom has two campaigns, of which Patton’s Best is more complete. Select your campaign with [Enter], after which you can select the settings that will determine how the campaign will be played. Tank Selection: Selecting Strict means that you must begin with the weakest Sherman model, the basic M4, and when replacing your tank due to destruction or refit, you may only accept the randomly offered model. The list of available Sherman models is weighted by historical availability, so your chances of being assigned a particular model will vary month to month. Selecting Unlimited means that you can choose any historically-available model of Sherman tank at the start of the game, when replacing a destroyed tank, or during refits. Commander Replacement: Selecting Realistic means that if your Commander is very seriously injured or killed, your campaign ends. Selecting Casual means that your Commander is replaced like any other crew member following an encounter. This means that you can continue to play through the full campaign, replacing commanders and tanks as you lose them. If you do select Unlimited and/or Casual, codes for these selections will appear alongside your score in the high scores record. Once you’re made your selection, press [Enter] to continue. Campaign Start Date: You have the option of starting the campaign at any point in the campaign calendar. Note that this will make the campaign shorter, but will give you quick access to certain tank models (in Patton’s Best) that only become available later in the calendar. Once you have selected your campaign settings, the first day of your campaign will begin. If you selected Unlimited Tank Selection, you will see an extra menu which allows you to scroll through currently-available Sherman tank models and select the one in which you will start the campaign. On the next screen, input a name for your tank. You can press Control + [R] to generate a random name, or enter anything you like. The next step is to enter a name for your Commander, who represents you. Just as with the tank name, you can press Control + R to generate a random name. At the start of the game you are assigned crew members for your tank. Each crewman has a role to play within the tank. The Commander represents you, and is in charge both of this tank and of the larger battlegroup. He can give bonuses to use the main gun, machine guns, or in moving the tank. The Gunner controls the turret, and fires the main gun and the co-axial machine gun. The Loader loads shells into the main gun, and reloads it after it has fired. The Driver drives the tank, and the Assistant Driver can pass shells up to the Loader as well as firing the bow-mounted machine gun. Some models of tank like the Sherman VC “Firefly” have no Assistant Driver position. For each crew member, you have the option of assigning skill points to them now, or saving the points for later. Each skill has a brief description of its effects and a list of possible activation numbers. Once your crewman has at least one level of a skill, the game will automatically roll to see if it activates any time it is eligible. The percent chance of activation is displayed along with the skill. For example, ‘Fire Direction’, which is a Commander skill, starts at a 3% activation chance when you first add it, but it can be upgraded by spending further skill points on it, first to 5%, and finally to 7%. You never have to manually activate skills: any time they can be used, the game will test for them automatically. It’s a good idea to spend these skill points right away, since they can start having benefits right from your first battle encounter. American tank crews will gain access to the “Gyroscope” skill for your Gunner once you have reached the first refit period in the campaign. This allows you to fire and move in the same turn, albeit at a penalty to hit. Apart from your commander, the remainder of your crew are randomly assigned names, although these can be changed later in the Tank Crew Info window. Once your crew is ready, the screen will shift to the Campaign Calendar view. Each day of the campaign calendar will have a mission type and an expected enemy resistance level. Some days you may be advancing through light resistance, while on others you must defend against a counterattack by heavy opposition. Current weather conditions are also displayed in this screen, although the weather may change throughout the day. Throughout the campaign, your company will sometimes also be called back for refitting. If you selected Unlimited Tank Selection, during refits you may switch to any model of Sherman tank. With Strict Tank Selection, you will be offered a random model to switch to. From the Campaign Calendar menu you can [B]egin the combat day, which will allow you to prepare your tank for combat and proceed to the Campaign Day map, or [V]iew your tank, bringing up the Tank View. You can also Save and [Q]uit to the main menu, to continue your campaign later on. At this point, you may wish to open the Settings window to set whether you want animations to be displayed or sound effects to be played during your campaign. You can also choose whether in-game pop-up messages wait for you to press Enter before being cleared, or whether they are cleared automatically after a short pause. The Campaign Calendar is the first place from which we can access the Crew Info Window with F3, so it’s a good idea to open it now to review your crew. In the Crew Info Window you can view the current status of all five tank crewmen. For each one, their level, current experience points and experience points required to advance to their next level, and current number of skill points is displayed. Light Wound: The crewman has received a light wound. This increases the chance that later wounds will be more severe, but has no other effect. The crewman will recover from a light wound at the end of the campaign day. Serious Wound: This has a greater influence on subsequent wound chances, and will be accompanied by one or more negative status effects as described below. Healed at the end of the campaign day. Very Serious Wound: This has a very significant impact on subsequent wound chances, will very likely result in a negative status effect, and at the end of the combat encounter, the crewman will be sent back to HQ for medical treatment. Stunned: Crewmen can be stunned from incoming fire that hits the tank but does not penetrate the armour, and from being wounded. Stunned crewman cannot do any actions, but if the tank is knocked out they can attempt to bail out, albeit at a penalty. Crewmen attempt to recover from being Stunned at the end of the crew action phase, and automatically recover at the end of a battle encounter. Unconscious: Unconscious crewmen cannot do any actions, and cannot attempt to bail out. They automatically attempt to recover as with Stunned crewmen. Dead: The crewman is dead. Experience points are awarded for capturing or defending areas on the campaign day map, as well as when your tank destroys enemy units, either through direct fire or through Advancing Fire. Skill points can be spent at any time to either gain new skills, or to upgrade skills your crewman already has. From here you can press [ESC] to return to the Campaign Calendar. The final piece of important information displayed in the campaign calendar screen is weather information. Overcast skies may lead to precipitation in the form of Rain or Snow. They also prevent the use of Air Strikes. Finally, press [B] to begin the campaign day. Once you begin an action day, you will first need to load ammo into your tank and set it up. The Main Gun Ammunition menu is used during resupply and when your loader is restocking the ready rack. For now, use the menu to load ammunition into your tank for the day. In ArmCom there are five types of ammunition for your main gun, although not all will be present in all types of tank. HE: High Explosive, best used against infantry or very lightly-armoured vehicles. Can be used in Area Fire or Direct Fire modes. Availability: 75 and 76mm guns. AP: Armour-Piercing, best used against armoured vehicles. No effect on infantry. Must be used in Direct Fire mode. Availability: 75 and 76mm guns. WP: White Phosporpous, creates smoke. Must be used in Area Fire mode. Availability: 75mm gun only. If infantry units are hit with WP, they must pass a Pin test or be pinned. HCBI: Hexachlorothane-Base Initiating, creates smoke, more efficient than WP, but only a limited amount available each action day. Must be used in Area Fire mode. Availability: 75mm gun only. HVAP: High Velocity Armor-Piercing, best used against very heavily-armoured vehicles. Only a limited amount available each action day. Must be used in Direct Fire mode. Availability: 76mm gun only. APDS: Armour-Piercing Discarding Sabot, similar to HVAP but issued to British and Commonwealth forces. Only a limited amount available each action day. Must be used in Direct Fire mode. Availability: 76mm gun only. Historically, WP was used on enemy positions since it produces chemical burns, while HCBI was used on positions held by friendly troops as it’s harmless. HVAP was normally only issued to Tank Destroyers, but a small number of Sherman crews sometimes managed to get a hold of some, so it is included in ArmCom as a limited-availability ammunition type. APDS is rare but becomes more plentiful from December 1944 onward. In general, you should load as many limited-availability shells as you can at the start of each day, and then load about 40% AP, 20% smoke if possible, and the rest HE. Note that at the start of each day your tank will expend HE shells on its way to the combat area, so be sure to stock a good number of these shells or else you might have to call in for resupply quite early in the day. You can also load more shells into your tank than its normal maximum, but each extra shell will increase the chance of fire and explosion should your tank’s armour be pierced by an enemy attack. Once you have loaded your ammunition, you should put some shells into the Ready Rack (RR). This is a small rack of shells that is mounted close to the Loader’s station. If you choose to reload from the Ready Rack during combat, you have a better chance of maintaining Rate of Fire (RoF), meaning you can fire off multiple shots in the same turn. Your loader can refill the RR during combat, but he cannot also reload the main gun in the same turn. Press [Enter] to return to the Tank View. The Tank View allows you to control many aspects of your tank and crew. This view is one of the major components of the Encounter interface as well, and apart from game-related restrictions (eg. not being able to resupply during an encounter, etc. ), its functionality is exactly the same whether you access it from the Campaign Calendar or the Campaign Day views. Many of the commands remain the same as when used during a battle encounter. 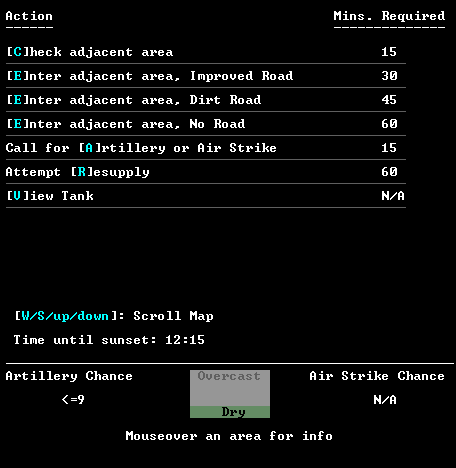 This view displays your tank’s name and model, current ammunition levels in general stores and in your Ready Rack, the type of Main Gun on the tank, the type of ammunition currently loaded, your selection as to which ammo type to use when reloading, and whether or not your Loader will reload from the Ready Rack. Extra equipment such as Smoke Grenades and Smoke Bombs is also listed. 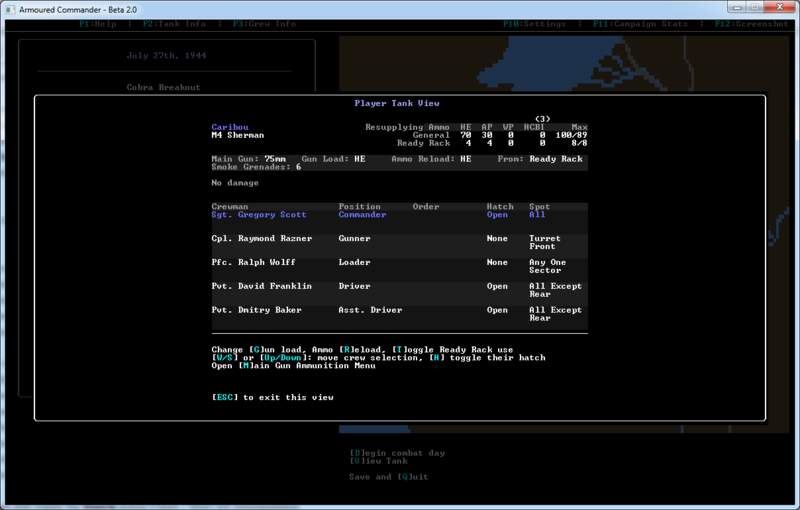 Each of your crewmen are displayed along with their position in the tank, their current order or status (only displayed while in a battle encounter), their hatch status, and their spot ability. Active commands that are available to you are listed at the bottom of the window. In the Tank View you can also toggle the Hatch status (Open / Shut) for crewmembers whose position has a hatch. Crewmen with Shut hatches have less chance of spotting and/or identifying enemy units, and suffer penalties for certain actions, but are not vulnerable to being injured by small-arms fire or enemy artillery attacks. Exposed crew with open hatches may be injured if an enemy infantry squad attacks your tank, or if there’s incoming artillery fire. Hatch status also has an effect on the areas where the crewman can attempt to spot and/or identify enemy units, as with a closed hatch they must use periscopes or gunsights to scan the outside. You can only toggle a crewman’s hatch during combat in the Action phase. For now, it’s usually good practice to keep all hatches Open until a battle encounter actually begins. Once you are satisfied with your tank, press [Escape] to begin your day by heading to the combat area. If you have just started a campaign you will see a description of the day’s mission, after which you will spend a random amount of time and HE shells on your way to the start location. From the Campaign Day map you choose how to proceed across enemy territory toward your objective. The map is made up of Map Areas, outlined by a dark green polygon shape, with a single white dot at its center. 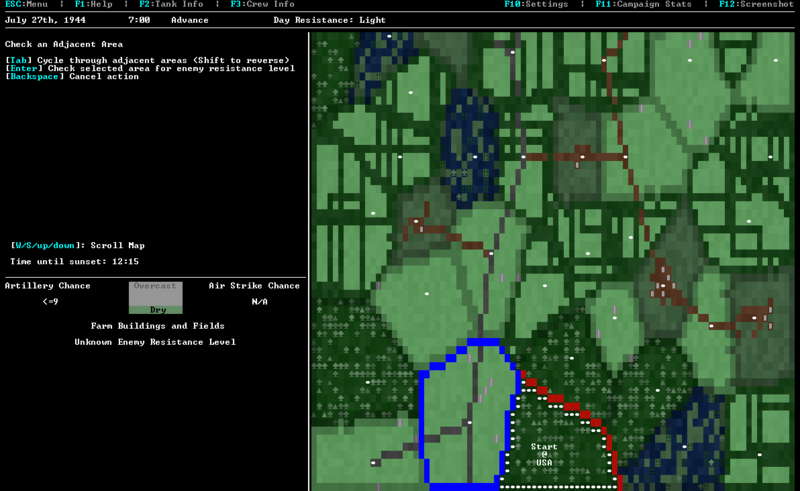 The at (@) sign indicates the present location of your tank and the friendly forces within your battlegroup; your present map area is also higlighted by a ring of white dots, as in the bottom right of the image above. A ‘USA’ label means that the map area has been captured by friendly forces. All other map areas are currently under enemy control. To capture an area you must move into it; if a battle encounter is triggered you must win, if no encounter occurs you capture it without a fight. Plain background and one or more grey buildings: Farms and Fields. Capturing these areas is worth 1 VP, but battle encounters are slightly more likely to occur here, and enemy resistance is slightly more likely to be higher. Plain background and no grey buildings: Fields. Capturing these areas is worth 1 VP. 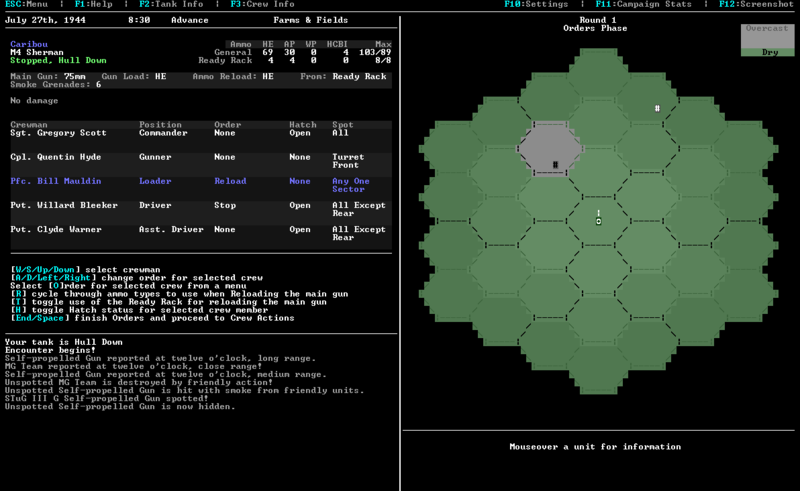 No modifiers to battle encounter chance, resistance level, or enemy unit spawn distance. Plain background and a light brown area: Village. Capturing these areas is worth 3 Victory Points, but battle encounters are much more likely to occur, resistance is more likely to be higher, and enemy units will more often spawn at medium or close range in a battle encounter. Darker background with trees: Woods. Capturing these areas is worth 2 VP, but enemy units are more likely to spawn at closer ranges in a battle encounter. Plain background with green lines: Bocage. Worth the same as Fields but if an encounter occurs, vehicles are much more likely to have Hull Down status and enemies will spawn at closer ranges. Capturing an Exit Area is worth ten times the normal VP award. Light tan lines indicate that map areas are connected via a Dirt Road, while dark grey lines indicate an Improved Road. When you start your campaign day, you will spend a random amount of time and HE rounds to arrive at your Start map area. Once you have arrived, you may check any adjacent area to determine the enemy resistance level. This initial check costs no time, but each subsequent check consumes 15 minutes. In the example map above, the map area to our left has been checked and it has a Light level of enemy resistance. Area resistance levels are randomly determined but scale according to the expected level of resistance for the day. For example, if the expected resistance for the day is Heavy, each map area will be much more likely to have Heavy resistance within it. The area resistance level determines how many enemy units will be spawned if you enter it and a battle encounter occurs. Once you’ve done your free check of an adjacent area, you are free to proceed however you wish, using the commands listed on the left of the screen. You can head toward the exit area if you wish to try for its bonus VP, or capture individual areas around the map. In a Counterattack mission you are more restricted in the actions you can take. You may only move into friendly-held areas that are also adjacent to an enemy-held area, and encounters will be triggered by waiting, by moving, or by resupplying. Each action on the campaign day map, with the exception of viewing your tank, takes up time and brings you closer to sunset and the end of the combat day. Check adjacent area allows you to determine the level of enemy resistance in any adjacent map area. Entering an adjacent area takes a different amount of time depending on whether or not your present position is connected to it via a road. Ground conditions and weather may increase the time required for these actions. If you enter an enemy-controlled area, there is a chance that a battle encounter will be triggered. If you suspect or know that there will be significant resistance in an enemy-held area, you can spend time to attempt to call for artillery or an air strike on an adjacent area. You start the day with a set artillery and air strike chance, which is reduced by one each time you are successful, to a minimum of two. The roll to call in a strike is 2D6, equal to or lower than your strike chance is a success. You may call in either type of strike on any adjacent enemy-held area, but not both. If you have called in a strike on an area and later enter it, triggering a battle, will get a free attack at the start of combat. If your tank is getting low on supplies, you can attempt Resupply, and if successful, you can reload smoke grenades, smoke bombs, and any normal ammunition type. 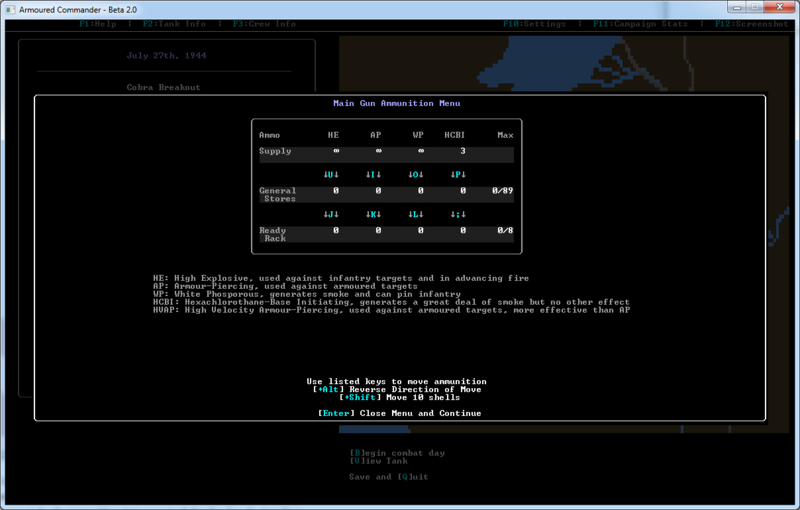 Finally, you can View your tank to set gun load, reload type, hatch status, and so on. You continue to move and act on the Campaign Day map until sunset, or until your tank is destroyed or disabled in combat. As in real life, the time at which sunset occurs varies by season. The remaining amount of time before sunset is displayed at the bottom of the Campaign action console, along with the current weather conditions. Sometimes random events will occur during the day, such as loss of a previously-captured area, or reinforcement of an area of known enemy resistance. You may also receive radio messages from HQ regarding optional missions that can be completed. These bring bonus VP, but may take you away from the most efficient route toward the exit area. When you move into an enemy-controlled area, you have the option of using Advancing Fire, which uses up HE rounds but grants you a free attack at the start of any combat. Note that you can use both an artillery or air strike and advancing fire on an area if you wish. Moving into an enemy-controlled area, or waiting for an attack during a Counterattack mission, will eventually trigger a battle encounter. When this occurs, play moves to the encounter map, where you battle enemy forces. Combat encounters take place on an encounter map made up of hexagon-shaped locations. Your tank is represented by the character in the centre of the map, and your current turret facing is shown by the white indicator. Your tank is always represented in the centre hex of the ecnounter map, and the hull of your tank is always assumed to be facing upwards; if you pivot your tank, then enemy units and smoke will rotate around you. Similarly, if you move your tank far enough forward or backward, units and smoke will shift upward or downward. There are three range bands on the encounter map, highlighted by different background shades: close, medium, and long range. Spotting, identifying, and hitting enemy targets at longer ranges is more difficult, and it is more difficult for attacks coming from further away to hit you. Map hexes are also divided into six sectors, indicated by the dark-coloured boundaries: front, rear, and two sectors for each side. Sectors are important for two reasons: first, your main gun can only fire at targets in the sector that it is facing. In the image above, our main gun cannot target either of the targets currently on the map. Your co-axial machine gun is also restricted to firing in the turret facing direction, while the hull machine gun can only fire in the sector to your hull’s front. Second, if an attack from an enemy unit in a side or rear sector hits you, then the attack will be worked out against your side or rear armour, which is weaker than your front armour. The exception to this is when an attack hits your turret, in which case your turret facing is used instead. The exact position of an enemy unit within a hex location has no effect on gameplay; only the hex range and sector is taken into account. Each sector is controlled either by friendly or enemy forces, units that are not represented on the encounter map but which help determine the effectiveness of certain attacks. If a sector has a ‘USA’ indicator next to it, then it is under friendly control. Enemy units will never spawn in friendly controlled sectors, and the more sectors you have under friendly control, the more effective friendly actions are. Information about your tank is displayed in the Tank Console. In the bottom section of the tank console is a list of commands that you can use in the current phase. In the bottom left of the screen is the Message Console, where announcements about events in the encounter are displayed. Enemy units can be in one of four statuses, representing whether or not your forces know exactly where the unit is on the encounter map, whether you have a clear Line of Sight to it, and whether your crew has identified exactly what kind of vehicle unit it is. Hidden: You do not have a clear line of sight to the unit; a terrain feature is blocking the way. Neither you nor the enemy unit can attack one another. If either you or the enemy unit moves, Hidden status is lost and the unit becomes Unknown. Note that since AT Guns cannot move during an encounter, Hidden AT Guns are effectively neutralized until their status changes. Unknown: You have received reports of a unit in this area, but you have not yet spotted it. Unknown enemy units can and will attack you and friendly forces, but you cannot attack them directly until they are Spotted. Spotted: You have spotted the enemy unit and are able to target it with attacks. Identified: Enemy Tanks, SPGs, and AT Guns must be Identified before you know exactly what type of unit they are. Unidentified enemy units will continue to move and attack as normal, but you will not know whether they are armed with a powerful gun and heavy armour or not. Infantry units and other vehicle units do not need to be identified: you will know what type they are after you Spot them. The character used to represent an enemy unit indicates its type. You can hover the mouse over an enemy unit on the map to see for information about it, and can right click to get additional information. Enemy units in terrain such as buildings and woods are more difficult to hit. They will also fail morale tests less often since they are in cover. If a vehicle is Hull Down that means that most of it is behind something large and solid such as a hill or stone wall. Any hits on its hull will have no effect. Infantry units can be Pinned and vehicle units can be Stunned by incoming attacks. Pinned units cannot attack and can only move away, but they will test to unpin in their next turn. Stunned units cannot do anything, but will attempt to recover in their next turn. If a Stunned vehicle is Stunned again, the crew abandons the vehicle and it counts as destroyed. Vehicles and AT Guns start facing a particular direction. Enemy units must face you to attack you or your allies. Hits on the side or rear armour of vehicles will be much more effective. Immobilized vehicles cannot turn. Each time you or an enemy unit moves, there’s a chance that its facing direction relative to you will change. At the start of an encounter, between two and four enemy units will appear on the map. At first you may only know the general type of unit that has been reported; you will need to spot and perhaps also identify the unit to know more about it. The range at which enemy units spawn is modified by the terrain type of the map area in which the encounter is taking place. If you successfully called in an artillery or air strike on entering the current map area, this attack will be worked out first. If you used advancing fire when moving into the current map area, this attack is worked out now. In an Advance or Battle mission, when you trigger an encounter by moving into an enemy-controlled map area, there is a chance that the encounter will begin with the defending forces unleashing an ambush on you and friendly forces. In a Counterattack mission, you have the chance to ambush enemy forces as they advance on you! In either case, a successful ambush means that the ambushing side gets to do an attack phase before the normal turn sequence begins. A successful ambush will be followed by a single Random Events Phase, described below. After the above phases have been worked out, the encounter proceeds with each turn having the following phases, until either your tank is knocked out or all enemy units have been destroyed or have left the encounter map. For some crewmen, their order or hatch status means that they can only spot in one map sector for this turn. If this is true for one or more of your crewmen, you get a chance to choose which sector they will spot in for this turn. You can change this selection each turn if you like. In this phase your crew automatically attempt to spot and/or identify every enemy unit on the enounter map that they are able. An enemy must be spotted before you can attack it directly; unspotted units are called “unknown.” Spotting attempts are modified by a number of factors, including the range of the enemy unit, its terrain, smoke in intervening hexes, and so on. If an enemy unit moves or your tank moves, it reverts to “unknown” status and must be spotted again, but it remains identified. In this phase you may issue orders to any and all crewmen that are able to act. You may also toggle their hatch status, change the type of ammo to use when reloading the main gun, and other commands available in the tank view console. Note that certain orders require specific combinations to work; the commander directing main gun fire will have no effect if the gunner is not also ordered to fire the main gun. Descriptions of possible orders can be viewed with the ‘o’ command. If you ordered your driver to pivot or move the tank, or your gunner to rotate the main gun turret, these actions occur in the next phase. Pivoting your tank exposes different sides of your armour to different enemies, and may also lose your Hull Down status. Moving the tank has a chance of shifting enemy positions up or down on the hex grid, while attempting to move into a Hull Down status is more difficult but very useful for protection from enemy anti-tank attacks. Rotating your turret without firing is useful for setting up an attack in a future turn, or for positioning your turret’s front armour against a powerful enemy unit. Ordering your gunner to fire the main gun is resolved during this phase. As soon as the phase begins the game will try to select a valid target within the sector that your turret is facing. By using [A/D] or [Left/Right] arrows you can rotate your turret, and you can change targets with [Tab]. Note that each sector you rotate your turret before firing applies a modifier to your first attack. You can continue firing your main gun at the same enemy target as long as your crew maintains Rate of Fire, and you have ammo with which to reload to main gun. Rate of Fire means that the loader has managed to reload the main gun fast enough that the Gunner can fire another shot right away. Note that you will not know the effect of main gun hits until you finish firing. If you still have Rate of Fire but do not wish to continue firing, you can always proceed to hit resolution by pressing [End]. In this phase you can fire any and all tank-mounted machine guns that you are able, based on which orders you can given your crew. The AA MG can fire in any direction, the co-ax MG must fire in front of the turret, and the Bow MG must fire in front of the tank hull. MG fire is most effective against infantry units in the open, and will have no effect on even moderately-armoured vehicles. If you ordered your Commander or Loader to use smoke, it is applied in this phase. Note that the crewman’s hatch must be open to throw a smoke grenade. Early models of Sherman tank also do not have a smoke mortar fitted to the turret. If you ordered your Loader to restock the ready rack, in this phase you may move shells into and out of the Ready Rack via the main gun ammunition menu. If any of your crew are stunned or unconscious, they will attempt to recover from these effects automatically in this phase. Enemy units get a chance to move and attack during this phase. If an enemy hits your tank, the effects are worked out right away. Enemy units cannot maintain Rate of Fire and never apply Critical Hits on the player tank. Your tank is not alone! Allied armour and infantry units are working with you, and they have a chance to do some damage in this phase. Anything can happen in this phase, from a lull in the fighting during which 15 minutes is added to the current time of day, to an enemy reinforcement arriving on the battlefield. If you ordered a crewman to attempt a repair, it will occur during this phase. Any smoke on the battlefield will gradually get weaker each turn, until it is removed. An encounter will end when all enemy units are removed from the battlefield, whether through being destroyed, moving off of their own accord, or through being shifted off the map by player movement. If your tank is destroyed or you abandon it, the encounter ends as well. Damage to your tank can be caused by light weapons attacks, through weapons malfunctioning, and from penetrating hits. Types of possible damage are listed below. Repair Order: Which order is required to attempt a repair during an encounter. If no order is listed, system may not be repaired. Break Result: New damage applied if repair roll breaks the system. Broken systems have the same effect as a malfunction, except the damage may not be repaired. These represent a squad of 7-10 riflemen, one perhaps armed with a machine gun. Normally they are no threat to your tank unless one or more of your crew has their hatch open, but can they can destroy friendly infantry squads in your hex. However – there is a chance that they are armed with a Panzerfaust anti-tank weapon. If they are in close range, there is a chance every turn that one might fire its PF at you. A small squad with a medium or heavy machine gun. No threat to your tank unless they decide to attack and one or more of your crew has their hatch open. They can destroy friendly infantry squads in your hex. A troop transport armed with a machine gun. No threat to your tank unless they decide to attack and one or more of your crew has their hatch open. They can destroy friendly infantry squads in your hex. An armoured car used for reconnaissance, armed with a 20L light main gun. Little threat to your tank unless one or more of your crew has their hatch open. They can destroy friendly infantry squads in your hex. These units count as infantry and thus can’t be killed using AP rounds, use High Explosives. PaK 38 (50L Gun): Unlikely to kill even a basic Sherman on a front hit, it still has good chances on a side or rear hit though, especially to the hull. Don’t underestimate it. PaK 40 (75L Gun): Good odds of knocking out a basic Sherman on a frontal hit and a sure kill on side/rear hits. Against more heavily armored Shermans it will struggle to penetrate the front armor, but side/rear hits to the hull remain lethal. “Jumbo” Turreted Shermans are resistant to its fire even on side and rear turret hits, but the hull remains vulnerable on those facings. PaK 43 (88LL Gun): Extremely dangerous, and very effective even at long range. It will destroy even a “Jumbo” Sherman with ease. Unless you are facing an actual King Tiger, this is likely your priority target to deal with, or to avoid! Most Self Propelled Guns are basically a tank without a movable turret. Instead they have a gun “turret” built into the hull of the vehicle. They typically feature very strong front armor. All the SPGs in this game are armed with 75L guns, same as the PaK 40. The lightly-armoured vehicles may be harmed by HE, but for the most part, AP is a better choice. StuG IIIg: The most common SPG you will encounter. Strong front armour but very weak on the sides. Marder II and Marder III: Unlike other SPGs, the Marder’s cannon is operated by an exposed crew working from behind a heavy blast shield as opposed to the crew being enclosed. The Marder II is the rarest SPG you will encounter as it is rather obsolete. Most AP shots will destroy these lightly-armoured vehicles. JgdPz IV (JagdPanzer): A Panzer IV chassis built as an SPG. Meant to carry the same gun as the Panther Tank but wartime shortages resulted in many being built using weaker 75mm guns, such as the ones encountered in this game. Very heavy front armour, no chance of destroying it with anything other than HVAP on the front facing. JgdPz 38t (Hetzer): The Hetzer is very similar to the Jadgpanzer in most respects, the only functional different being slightly weaker side turret armour. Tanks vary a bit, but all should be treated as deadly foes. Only AP rounds will have any effect on these armoured fighting vehicles. PzKw IV (Panzer IV): Roughly equivalent to your own Sherman tank. This will be the most common enemy tank encountered. It is armed with a 75L Gun that has a similar performance to a 76mm Sherman gun firing AP rounds. Best to engage from the side or rear, but even the front hull armour has a chance of being penetrated by a 75mm gun. PzKw V (Panther): Deadly. It mounts a 75LL gun, which means it is even more effective at longer ranges. Heavier front hull armour and a more powerful gun than the Tiger. Attacking it from the side is a must. PzKw VIe (Tiger I): Armed with an devastating 88LL cannon. Only the front hull armour of a Jumbo has a chance to survive a hit. Very rare, engage with extreme caution. As with the Panther, only side/rear hits have any chance of destroying it. PzKw VIb (Königstiger / Tiger II / King Tiger): An improved Tiger I. Extremely Rare. Same main gun as the Tiger I, but the heaviest front hull armour in the game. Run away, or try for a flank or rear shot!